Acqualina Resort & Spa in Miami Beach announces the appointment of Tamir Kobrin as the resort’s Managing Director, overseeing all aspects of the resort and condominium operations. He is exceptionally capable of ensuring that we continue to deliver unparalleled service and unrivaled value to our hotel guests and residents. Acqualina Resort & Spa on the Beach, South Florida’s ultra-luxury resort, is pleased to announce Tamir Kobrin has been appointed Managing Director of the Forbes Travel Guide Five Star and AAA Five Diamond Award winning resort. In his new role at Acqualina, Kobrin will oversee all aspects of the resort and condominium operations, facilities management, guest experiences, and employee enrichment. Kobrin is well versed on setting benchmarks for guest satisfaction, revenue growth and market share penetration. His hands-on, lead-by-example management style is one of transformational and inspirational leadership that teaches and guides employees to achieve and deliver excellence through the practices of consistency and dedication. Kobrin’s performance recognition includes acknowledgment from Condé Nast Traveler, Travel & Leisure, Robb Report, and Trip Advisor Choice Award Winner for 2013. Fluent in five languages, Kobrin is an internationally regarded hospitality executive with nearly 20 years of experience working for luxury hospitality brands. He has held management positions at prestigious hotel groups such as Raffles, Mandarin Oriental, and Ritz Carlton. Kobrin’s experiences include Italy, Israel, Switzerland, Cambodia, Hong Kong and New York City. 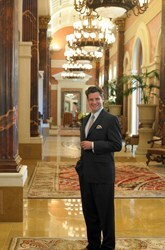 Immediately prior to joining Acqualina, Kobrin was General Manager at The Leela Palace in New Delhi, India. While at The Leela Palace, Kobrin directed a team of more than 800 and managed the $450 million completion of the state-of-the art, gold LEED certified property. Kobrin has earned a diploma in hotel management from Les Roches Hotel Management School and followed this up with a senior development programme at Cornell University. Acqualina Resort & Spa on the Beach is one of ten hotels in the Continental U.S. to achieve both the coveted 2013 Forbes Travel Guide Five Star Award and the 2013 AAA Five Diamond Award. The luxury Miami Beach hotel was recognized by Travel + Leisure Magazine’s 2013 World's Best Awards list as one of the top 10 best small city hotels in the Continental U.S. This year, Acqualina was also recognized for Excellence in the Category of Best Family Program by Virtuoso. Mostly recently, Acqualina received the Condé Nast Traveler Readers Choice Award as one of the Best Resorts in Florida and is the recipient of the 2013 Spafinder Wellness 365™ Readers’ Choice Category Award for Best for Weddings and Best Interior Design. A seaside luxury haven located on 4.5 beachfront acres in pristine Sunny Isles Beach, Acqualina Resort & Spa features 98 impeccably appointed guest rooms and suites and 188 residences with breathtaking views of Atlantic Ocean. Step into a world of luxury with unprecedented accommodations and service, the first ESPA-branded spa in the United States, world-class dining destinations, including Piazzetta Marketplace and Restaurant and Il Mulino New York, three oceanfront swimming pools, beachfront event space, executive boardroom, and an award winning innovative marine biology-based children’s program. For more information on Acqualina, please visit http://www.acqualinaresort.com. For reservations, please call 305.918.6777 or 888.804.4338.